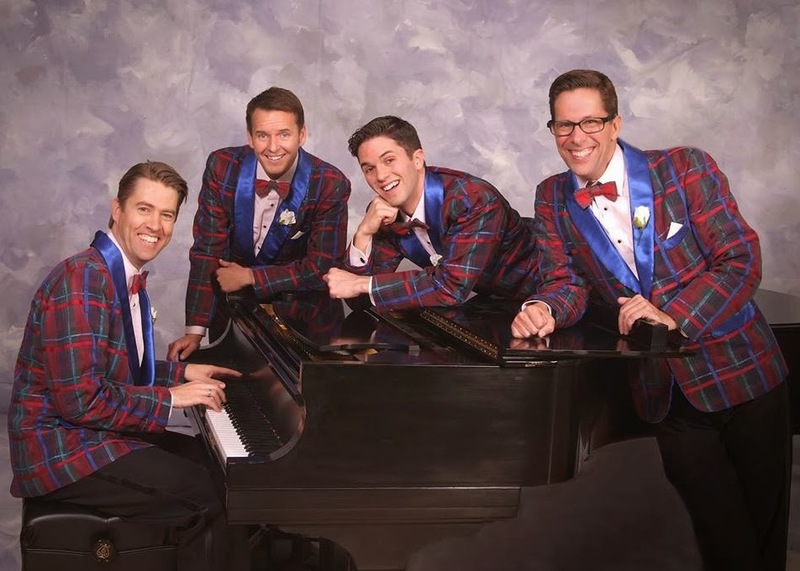 Roger Befeler, Kurtis Simmons, Me, and Scott Dreier in Forever Plaid at Cabrillo Music Theatre. It was towards the end of 2010 when I received my first phone call from Kevin Traxler. He told me he was putting together a mini tour of Plaid Tidings, the holiday version of the now classic Forever Plaid. I had previously learned two of the four roles in that show, and he asked if I'd be willing to learn the role of Sparky this time around. Since it's almost impossible for me to say "no" to work, I took the offer very seriously. I sat down with my calendar to see if I could somehow pull off Plaid AND The Holiday Spectacular at the same time. As it turned out, the few Plaid rehearsals would be done before the other show even started, and the mini tour dates were on Fridays, which just so happened to be my days off during The Holiday Spectacular rehearsals. It would be hectic, but it was absolutely possible. I started learning as much of "Sparky" as I could by myself since the other three Plaids had all done their roles in previous productions of Plaid Tidings. I eventually felt prepared enough to show up to our first rehearsal at the director's house right before Thanksgiving. I knocked on the door and was immediately greeted by Kevin, who answered wearing an apron. The house smelled wonderful, filled with a sweet and spicy aroma of slow cooked meat. Kevin asked if I would like some wine. I politely declined. Then we started rehearsal. as always, taking the picture. The three Plaids and I stood around the piano and sang through the score. Every once in a while I'd ask if we could do something again, and everyone would graciously oblige. Every know and then we'd hear Kevin holler from the kitchen, "Sounds great!" After about two hours of rehearsing, Kevin suddenly came into the living room and announced it was time to eat. We all went outside into a beautiful Southern California evening and took our seats at a table lit with candles and filled with gourmet worthy entrees. Along with Kevin and his wife, we ate and laughed hysterically at each others' stories from previous Plaid-encounters. I truly felt part of the family. That night was pretty much the only rehearsal I ever got for Plaid Tidings. The day before our first performance, we reviewed, this time in front of a mirror, and though I felt safe, I was terrified I'd mess things up. Kevin wasn't. The subsequent mini tour of Plaid Tidings turned out a lot of memories: The show in Palm Desert where two old ladies said we talk too much, despite the 20 something songs we had just sung. The time in New Mexico where our van got stopped at Immigration because our piano player had an English accent. The show in Arizona where the bass player and I had to drive to the airport in the middle of the night to get back to rehearse The Holiday Spectacular. I wouldn't have had it any other way. Last year, towards the end of 2013, I was happy enough to get another phone call from Kevin Traxler. This time it was to do Sparky in a production of Forever Plaid that he was producing, funny enough, at Cabrillo Music Theatre, where I had sashayed with Shirley Jones all those years before. The offer was a no brainer. I accepted immediately. I couldn't wait to have a family reunion. Then, about a month before we were to begin rehearsals, I learned that Kevin passed away. As Sparky says in Forever Plaid, "Funny thing...death." It's strange, preparing this delicious experience of a show without Kevin around to season it. It's even stranger to be doing a show about mortality while knowing the person who brought you there to do it isn't here anymore. But I love being a Plaid. And I'm proud to be a Plaid. And I know I wouldn't feel that way without having known and loved Kevin Traxler. So this one's for him, and I sincerely hope you will all come and enjoy our show. That is, after all, exactly what Kevin would've wanted.